There is no generic sizing for kids shoes but, we are here to make that easy for you. We have measured the insoles of all of our shoes and converted them our own Kids Got Sole Aus sizing (similar to a Target equivalent). This should make your shopping experience a whole lot easier. So if you know your child is a Vans US10 - you can look at the charts below (or in the description of each product) to see that it is an Aus 9. So if you want to shop for other brands on our site, you just need to look for the Aus 9 and that will be your perfect size for each brand. We've now got StrutFit, a new sizing application available for you to easily get your child's Aus size. To use it, you will require a smartphone, an A4 sheet of paper, and your child! Go ahead and click the button below to get started. If you don't have what's required to use StrutFit, or want an alternative, then follow the steps below to measure them and then get your Aus Size. Grab a measuring tape (if using a ruler, make sure the measurements start from the edge of the ruler). Stand them against a wall (good luck with toddlers lol) and make sure their heels are right up against the wall. Make sure their feet are straight (see pic below). Repeat for both feet as one is generally bigger than the other. Use the biggest measurement. Add 8 to 10mm for new walkers and up to 13mm for older kids to your biggest measurement. This will give you your insole measurement (the maximum size the insole of the shoe can be). If you have any questions about sizing, please send us an email or call us on 043700875 we are here to help! 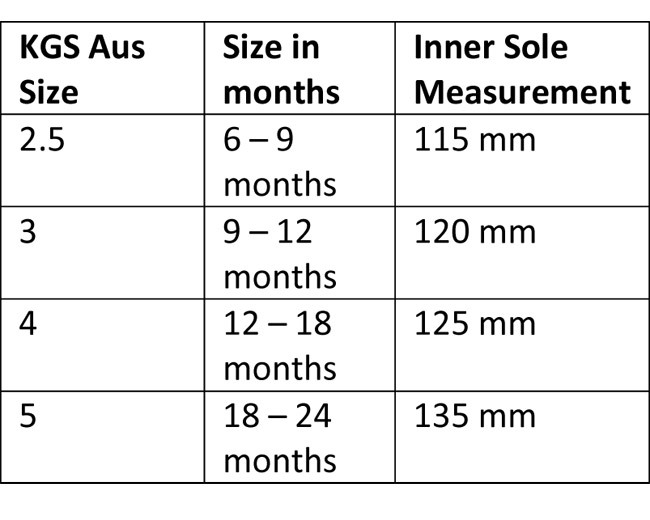 If you already know what sizes your kids are in Vans, Skechers, Dr Martens, Freycoo or Caroch - you can use the charts below to convert them to Aus sizing - then you can shop all brands across our site using the Aus sizing.